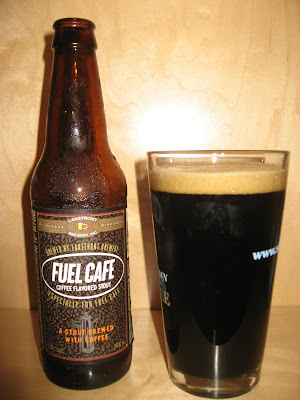 I'm going to start doing reviews of beers that are available here in South Florida and the one that I have decided to start with is one I have been sitting on for a bit: Lakefront's Fuel Cafe Coffee Flavored Stout. I got this one a little while back in a sampler pack but for some reason hadn't tried it yet. My friend from Milwaukee swears by Lakefront so who am I to not try it out? Most of the other beers I had in the pack were quite good. I cracked the beer open and poured it into a pint glass. The initial smell of coffee was quite evident so the name wasn't a lie. It gave a pretty big light brown head that stayed throughout the time I drank the beer. The color of the actual beer was jet black. The mouth feel was not what I was expecting at all from a stout. Very watery. It didn't give me that nice roll-around feel in my mouth that I usually like from a stout. The taste of coffee and malt disappeared quite quickly and just left a slighty bitter aftertaste. Overall, I was pretty disappointed by this beer. The other Lakefront beers that I have had were much better than this one. I would even say this is the worst of the Lakefront beers I've had. It's really too bad that the other beers in the sampler pack only seem to be available in the pack and not separately. I would gladly trade in the Fuel Cafe for their River West Stein any day. Did anyone have a similar or different experience? Hi Dave, I'm glad i found your blog! 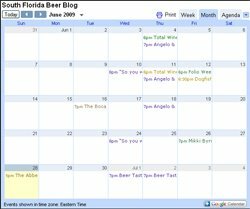 I recently moved to Miami from Milwaukee where I was a frequent patron of the Lakefront Brewery Tour. I love it here in Miami, but back in Milwaukee, I used to live in the Riverwest neighborhood and I severely miss Riverwest Stein. I was hoping you could throw me a lead as to where I could find it for sale near Miami. I would certainly appreciate it. Completely agree with you on the Fuel Stout. Fuel is a well known cafe near the Brewery. It's a much better cafe than a beer, but batches vary greatly. One pint from the Brewery after a big meal is perfect. I'm Lookin forward to reading your blog! Riverwest Stein unfortunately is not available in South Florida. It is available in the sampler pack that used to be carried at the Whole Foods on South Beach but they no longer have it. Maybe if you bug them enough they will get it back in.